The 50 Years of Victory was built in 2007 and is the largest and most modern nuclear-powered icebreaker in the world. She is a new generation ship, an upgrade of the Arktika-class. Accommodating a maximum of 128 guests and carrying the highest ice class possible (LL1), she is one of the only ships that can undertake a voyage to the North Pole. With 74,000 horsepower generated by two nuclear reactors, the vessel can crush ice up to two and a half metres thick and is the world’s largest and most sophisticated nuclear-powered icebreaker. The 50 Years of Victory is the property of the Russian Federation and has received maritime registration under the name 50 LET POBEDY. The icebreaker features 64 cabins and suites. All the cabins and suites afford outside views (opening windows), private facilities with bathtub or shower. Most of the suites have two rooms. Minimum cabin area is 14 sq.metres (151 sq.ft. ); maximum is 29 sq.metres (314 sq.ft.). Cabins are spread over four decks and all have an exterior view with windows that open and en-suite facilities. All cabins have a TV & DVD player. Standard Twin (44 cabins): 1 lower berth, 1 sofa bed, private facilities with a shower, TV set and DVD player, opening windows. Mini suite (6 cabins): Sitting area with sofa bed, sleeping bed separated from the sitting area, private facilities with a shower, TV set and DVD player, refrigerator, opening windows. Suite (6 cabins): Bedroom and sitting area, sofa bed in sitting room, private facilities with bathtub or a shower, refrigerator, TV set and DVD player, opening windows. Victory Suite (1 cabin): Large bedroom and sitting room, sofa bed in sitting room, private facilities with a shower, refrigerator, TV set and DVD player, coffee maker, opening windows. Arktika Suite (5 cabins): Very spacious bedroom and sitting room, sofa bed in sitting room, private facilities with a bathtub, refrigerator, TV set and DVD player, coffee maker, opening windows and safe. Public areas include the dining room where seating is unreserved, the aft Saloon for lectures, presentations and socialising, the bar and lounge with front view to the bow of the ship, library and lounge, gym, two saunas and a swimming pool with heated sea water. There is also a clinic with a licensed doctor. A lift serves all decks and the Navigation Bridge is open for visiting. One of the highlights of the North Pole voyage aboard the 50 Years of Victory is a tour to the engine room where travellers can learn all about the unique icebreaking capabilities of the “Victory” and how pack ice is negotiated. The dining room is spacious, has free seating and meals are served to your table with a variety of international cuisine prepared by qualified chefs. All cruises include full board in the single sitting restaurant. Breakfast is provided buffet style; lunch and dinner are a mix of buffet with choice of soup and entrées and served dishes with choice of meat, fish or vegetarian. Afternoon tea is also provided daily with a choice of cakes. Coffee, tea and cocoa are available at coffee station 24/7. Among the specials are polar barbecues on open deck and on ice. With a crew of 140 and accommodating a maximum of 128 guests, this comfortable vessel has a friendly, casual atmosphere with the focus on the expeditionary nature of the voyage. An expedition cruise to the North Pole is an eventful one, and not only because every expedition day offers intense exploration of the Arctic. In the 24-hour-daylight at the peak of Arctic mid-summer, you will try to stay awake as long as possible seeking to spot another polar bear, or observing 75,000 horsepower icebreaker crushing multi-year ice layers three metres thick or socialising with new friends in the ship’s bar or lounge. Your “typical” expedition cruise day begins with a friendly wake-up call and breakfast. You will already know the plans for the day ahead as each evening there is a briefing. There might be a lecture or a talk by one of the onboard experts in the morning, or you might have a chance to relax and enjoy the stunning surrounding views. Then there comes the call to get ready for the first Zodiac or helicopter landing, and the day begins. Evenings are for relaxing; a calm time to curl up with a good book, chats with friends at the bar, watch a movie or relax in a sauna with heated sea water. But, if you haven’t had your fill from the day’s activities, there are some scheduled alternatives. There may be a lecture in the auditorium, or, of course, you can always spend a few more hours on the deck or Bridge looking at the wild Arctic landscapes as the ship sails by. An important part of our voyage is devoted to the lectures delivered by noted naturalists, scientists and experienced Polar explorers. Documentaries, feature films and slide shows are presented. “50 Years of Victory” is not a tourist ship. The main task of the icebreaker is to pilot scientific and cargo ships to hard-to-reach areas of the Arctic and along the Northeast Passage. 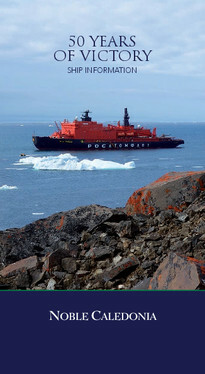 It is only in summer when adventurers get a unique chance to travel aboard a real working icebreaker. Day to day activities are planned carefully to make the most of weather conditions and wildlife sightings. The aim is for you to experience as much of the Arctic as possible and of course as safely as possible. Landings are carried out by helicopter and the Zodiacs are used to cruise the coast of Franz Josef Land to get close to wildlife. The qualified Expedition Staff, the experienced Captain and the Crew will do everything to make your voyage safe and unforgettable. There is also a clinic onboard with a licensed doctor. The icebreaker is equipped with the most up–to–date satellite navigation system and communication equipment. (Inmarsat and Irridium). The 50 Years of Victory is the largest and most modern nuclear-powered icebreaker in the world. For those with an appreciation of such vessels, the “Victory” is a new generation ship, an upgrade of the Arktika-class, the most powerful icebreakers in the world. Designed with a stainless-steel ice belt, 5 metres wide, she is able to break through ice up to 2.5 metres thick. We do hope you have a wonderful expedition to the North Pole. Announcements in English over the ship’s public address system will alert you to wildlife sightings, itinerary changes and landing instructions for going ashore. On some voyages, announcements may be repeated in other languages. Out of courtesy to other travellers, we ask that you remain quiet during all announcements – even those made in languages that are not your own. Radio announcements in Russian are for the crew. You will have regular briefings throughout the voyage. These briefings allow your Expedition Leader and Team to provide you with information about upcoming landings and any itinerary changes that may occur. During your recap sessions you are encouraged to share your experience and wildlife sightings, or ask questions about the places you have just visited. Your schedule of activities, presentations, meal hours and films is usually posted one day in advance. Please remember that the unexpected is an everyday occurrence during a polar expedition, so it is possible that while you are sleeping it may be necessary to adjust the activities for the next day. Your daily programme notices and itineraries are meant only as guides. Whilst sailing, the Captain and Expedition Leader will constantly monitor weather and ice conditions, while collaborating to create as many opportunities as possible for you to enjoy landings and Zodiac cruises at the places you visit. Although there is a lift, unfortunately the ship does not have facilities for disabled, or wheelchair dependent, passengers. During the day we recommend comfortable, casual clothing that will be suitable against the elements. The evenings are smart casual. There will be welcome and farewell cocktail parties so you may like to bring something a little smarter for these events. A complimentary Parka, which is yours to keep, will be provided. Waterproof boots will be provided for the duration of your voyage. Further details will be advised in your pre-departure information. oltage is 220V/50Hz. The outlets are European Style (2 round pin). Most modern electronic devices support dual voltages, but please verify compatibility prior to plugging in your equipment. We recommend that you take a universal adaptor. The dining room is spacious, has open seating and meals are served to your table with a variety of international cuisine prepared by qualified chefs. All cruises include full board in the single sitting restaurant. Breakfast is provided buffet style; lunch and dinner are a mix of buffet with choice of soup and entrées and served dishes with choice of meat, fish or vegetarian. Afternoon tea is also provided daily with a choice of cakes. Among the specials are polar barbecues on open deck and on ice. The well-stocked bar is open for you to enjoy all-inclusive beverages with your fellow shipmates from the afternoon into the late evening. Soft drinks, juices and water are available, as is a selection of liquors, spirits, beers and wine. Complimentary coffee, tea, cocoa and water are available self-service 24 hours a day. If you bring any beverages onboard the ship, please confine consumption to your suite. If you do wish to bring your own wine to the dining room, a small corkage fee will be charged to your shipboard account. Water onboard is a condensate of evaporated seawater and is safe to drink. However drinking water is available if preferred. We recommend that you bring a refillable bottle to use onboard, or purchase one as a souvenir from the Polar Boutique. Special dietary requests such as vegetarian, low salt and low cholesterol should be made with Noble Caledonia in advance. However, we recommend that you contact the Hotel Manager once on board to reconfirm such requests. We regret that these, and any other special dietary needs, cannot be guaranteed. If you have any specific or special foods that you require we recommend that you take some with you. Kosher food cannot be prepared. Helicopter sightseeing flights are included in your expedition. Participants will be taken in groups, and will be flown around in turns. Helicopter sightseeing flights will only be operated if weather conditions are suitable, and when helicopters are not engaged in reconnaissance for further navigation. Therefore, flights often take place without much scheduling. A complete list of laundry charges will be provided when you are on board the ship. Laundry is collected each morning and request forms and bags are provided in your cabin. Please allow 48 hours for your laundry to be returned. Ironing services are also available, at a minimal charge. You are encouraged to take advantage of the laundry services, as it means you will be need to pack fewer articles of clothing. With your safety in mind, there will be a muster drill whilst in port, before your voyage begins. This mandatory drill will be scheduled by your Expedition Leader, with instructions from your Expedition Team. During the drill, you will be asked to locate your life vest in your cabin and remember your life boat and muster station. By international maritime law, everyone is required to participate in such a drill within 24 hours of sailing. Before you disembark the ship, please check your suite to ensure you do not leave anything behind. If you discover you have left any items behind, please contact Noble Caledonia within 21 days of disembarking. If we are able to recover your item(s) we will contact you to arrange delivery or collection, and any costs incurred will be at your own expense. There is an English-speaking doctor onboard, who manages a medical clinic that is stocked with a supply of common prescription medicines and basic first aid equipment. Please ensure that you carry an adequate supply of any medications that you may require. The US Dollar is the standard currency onboard. You can also use credit cards (Visa, MasterCard, Diners Club or American Express). You will need to register your card at the administrative office for an imprint to be taken. Personal cheques are not accepted. A “chit” system is used on the ship. This means that you will sign for items when you take them, but pay your account balance on your second last day of the voyage. If you are sharing a suite and would like separate accounts, you must advise the Hotel Manager. Please note that gratuities to crew are not included in your holiday price. The recommend amount is $13 to $15 US Dollars per traveller, per day. Gratuities are collected anonymously at the end of your voyage and are distributed among staff and crew at that time. They can be made in cash or charged to your onboard account. Gifts and souvenirs are great to take home as mementos of your polar expedition. In addition to small souvenirs, the Polar Boutique offers a selection of expedition gear, including base layer clothing and refillable water bottles. All items may be charged to your shipboard account. POST Post service from the Polar regions is slow and erratic at best. If the ship’s staff are unable to deliver your post during the voyage, they will try again on subsequent voyages, however delivery cannot be guaranteed. Receiving Polar mail is still a rare and memorable way to send loved ones a memento from your voyage. If you do send post, please bear in mind that your postcard may take as long as 8 months to be delivered. Your Expedition Team is carefully chosen for their combined experience, knowledge and passion for the Polar Regions. Through formal illustrated presentations, as well as informal briefings, your Expedition Leader and Expedition Team will cover a range of topics including ornithology, marine biology, glaciology, geography, geology, history and the environment. We are sure that you will enjoy the enthusiasm that they have for expedition travel! Biographies of your Expedition Team members will be provided to you when you receive your final documents before your voyage. Please be aware of pitching and rolling. When the ship is going through ice, there may be sudden lurches, rolls or other motions. Please use handrails whenever possible, especially when going up and down stairs. Please watch your step while passing through doorways; many of them have high steps. You are not permitted to smoke in cabins or public areas of the ship. Smoking is not allowed in the Zodiacs, helicopter or ashore. Please smoke in designated areas only and ensure your butts are safely and properly disposed of. You may control the temperature in your suite by adjusting the thermostat. Your suite will be cleaned on a daily basis. Your towels will be changed, along with your bed sheets, every third day, subject to the length of the voyage and in accordance with the supplier’s sustainability practices. If you would like your towels changed more frequently, please see the onboard Hotel Manager. Standard Twin: Bed: 1 lower berth and 1 sofa bed. Furnishings: TV, opening windows, safe, hair dryer, private facilities with shower and bathrobe(s) for use during the expedition. Mini Suite: Furnishings: sitting area with sofa bed, sleeping bed separated from the sitting area, TV, refrigerator, opening windows, safe, hair dryer, private facilities with shower and bathrobe(s) for use during the expedition. Suite: Furnishings: bedroom and sitting area, sofa bed in sitting room, TV, refrigerator, tea/coffee maker, opening windows, safe, hair dryer, private facilities with shower and bathrobe(s) for use during the expedition. Victory Suite: Furnishings: large bedroom and sitting room, sofa bed in sitting room, TV, refrigerator, tea/coffee maker, opening windows, safe, hair dryer, private facilities with bathtub and bathrobe(s) for use during the expedition. Arktika Suite: Furnishings: very spacious bedroom and sitting room, sofa bed in sitting room, TV, refrigerator, tea/coffee maker, opening windows, safe, hair dryer, private facilities with bathtub and bathrobe(s) for use during the expedition. During your voyage you may be invited to visit the Bridge, where you can observe how the Captain and Officers sail and navigate the ship. A map of your expedition path will be available, so you can see exactly where you have been. As the Bridge is an important working area on the ship, we kindly ask that you keep noise to a minimum during your visits to avoid distracting the officers from doing their jobs efficiently.